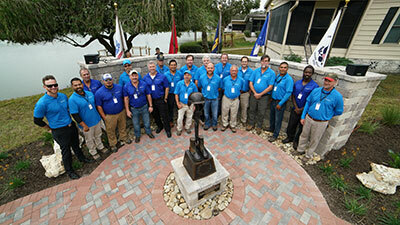 BrightView teamed up with community organizations in Florida to design and install a memorial park for veterans and first responders. The park features a flag representing each branch of the military, paver walks, a memorial wall, a commemorative plaque, new landscaping and a first responders’ fire pit area. The memorial was officially opened during a ribbon-cutting and dedication ceremony on Veterans Day weekend where team members from BrightView and Forest Lake Estates were joined by more than 600 Forest Lake community members, including 75 veterans and first responders, to dedicate a new memorial park. Forest Lake Estates in Zephyrhills, Fla., reserved the scenic lakeside location for the park, and BrightView donated the design, irrigation, hardscape installation and landscape installation and coordinated efforts with local and national vendors to receive all materials at no cost. The park will serve as a place of remembrance to honor the many veterans and first responders who reside in the Forest Lake Estates community and beyond. U.S. Lawns‘ home office team and local franchisees volunteered to help Second Harvest Food Bank of Central Florida. In one Saturday afternoon, U.S. Lawns, along with other volunteers, organized and boxed up 8,138 pounds of food for a total of 6,782 meals. Case Construction Equipment has extended its standard, full-machine warranty on all skid-steers and compact track loaders to two years, 2,000 hours (up from one year, 1,000 hours). The new full-machine warranty applies to all models in both product lines, with skid-steers ranging in operating capacity from 1,300 pounds up to 3,400 pounds, and compact track loaders rated from 2,700 pounds up to 3,800 pounds.